This year, remembrance celebrations have been particularly poignant as we remember the 100th anniversary of Armistice Day, a ceasefire that held and led to the Treaty of Versailles the following year. We have played our part at school in celebrating this special occasion, delicately, in an age appropriate way. 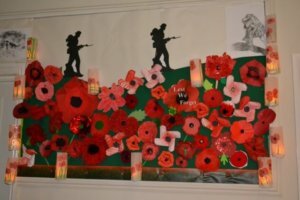 Our Year 6 led a moving assembly and many of the children contributed poppies to our wonderful display in the hallway. 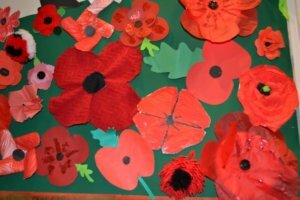 There were some personal touches, imaginatively created poppies and the lanterns have been particularly effective. ‘I am always so impressed with the Unicorns. It was a very long day for them and yet they behaved impeccably throughout. The children were so well drilled and they sang, marched and performed wonderfully. So a huge thank you to all at the Unicorn and those parents and teachers who gave up time to chaperone on Sunday’. It has been a busy couple of weeks on the sporting front and I was delighted to be able to see all Junior girls play netball at Dover House Road. The standard of play was excellent and I was particularly pleased to witness the determination etched on their faces, the delight when they scored, or won a match, but also their sense of comradery and good sportsmanship. I know this was the same with the boys’ football tournament on Kew Green where the Year 5 boys did superbly, playing against teams from the year above. Year 3 has had a very busy time since returning from half term. The last two weeks have included; a trip to the British Museum to continue their study of the Ancient Egyptians; a day’s recce of Sayer’s Croft in preparation for their residential trip next term, and of course, their wonderful assembly. I was fortunate to be able to see the dress rehearsal where, once again, the magic of performing and also learning so much was in evidence.